Fall is for crisp, cool weather, fire pits, and football. 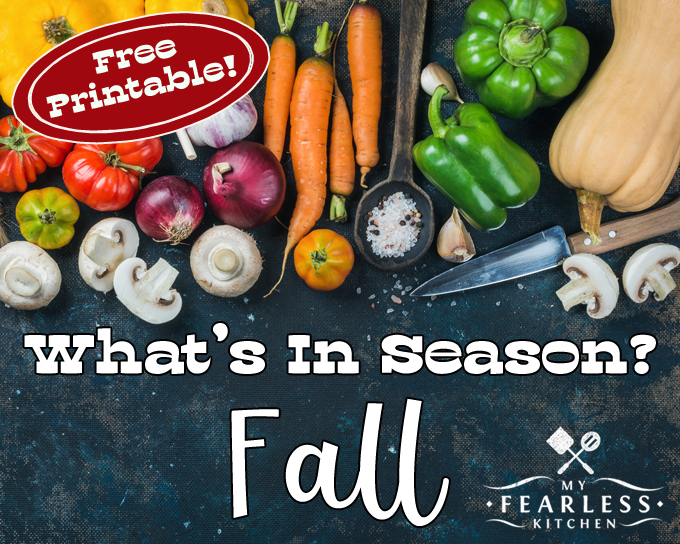 See what fall fruits and vegetables are in season, get the best deals, and try something new! Fall is my favorite season! The weather finally starts to cool down, the trees are beautiful, the mums start to bloom, and it’s time for boots and long sleeves! It’s also time for some of the absolute best seasonal fruits and vegetables. What Fruits & Vegetables Are In Season in the Fall? Many people don’t think of fall as a great time for in season fruits and vegetables. There is some amazing produce that comes into season this time of year. In the United States, September, October, and November are considered the fall months. This is the list of fruits and vegetables that are considered “in season” in the fall. Do you want a free printable version of this list to take with you to the grocery store? Click here to get one! Once you have all your fresh produce home, don’t let it go to waste! Be sure you know how to store fruits and vegetables properly to keep them fresh. I love containers like these Rubbermaid FreshWorks Produce Savers to keep my fruits and veggies fresh, and keep my refrigerator organized. What’s your favorite fruit or vegetable to enjoy in the fall? What Fruits & Vegetables Are in Season? Here are free printable lists of fruits and vegetables in season during other times of the year. What Do the Codes on Produce Mean?